A few weeks ago, members of the GDS Digital Inclusion and Assisted Digital team visited Castle House, a sheltered housing scheme that serves elderly and vulnerable people in Lambeth where they have created a “digital community”. The aim was to create a culture where older people were as engaged and confident about digital technology as young people. The World at Your Fingertips digital programme was started at Castle House with a small grant from Unltd, and later continued with a larger grant from Covent Garden Market Authority. The grants enabled long-term training and purchase of a range of equipment including video cameras and tablets for use by the residents and now they've even created their own website! The programme - and other local initiatives discussed below - builds on the premise that “nobody fully knows everything” when it comes to digital technology and therefore, to some extent, “we are all in the same position”. We all have gaps in knowledge and understanding and, while we may be confident in using technology that’s current today, there will always be a need to continuously learn to keep up to speed with using new technology. So, the solution is to create a “digital culture” and build long-term “digital resilience” which involves the entire community learning continually and sharing skills and knowledge. "We’ve created a digital community where people aged up to 90 are digitally savvy, using digital cameras and tablets as well as laptops, desktops, the internet, email etc. Our aim was to see if it is possible to create a culture where older people are as curious, confident and techy as their grandchildren - and the answer is yes!" The model is driven by the residents’ needs and motivations, rather than a one-size fits all ‘course’, which allows the scheme to take into account their diverse and ongoing learning requirements and is constantly evolving to ensure it is responsive to these. New models and approaches are continuously being developed as needs and interests change. 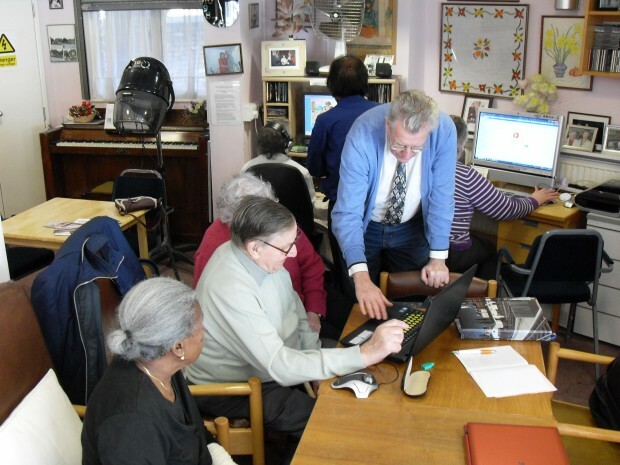 For example, the 2014 Fit and Connected programme expanded the digital work at Castle House into a wider context and brought in many more older people from Vauxhall Nine Elms. This programme provides weekly fitness training as well as digital learning and socialising opportunities. The purpose is to create a lasting digital culture, instead of delivering a single, one-off programme. This recognises that, for most of us, digital is a part of our lives and it is important to continuously learn. 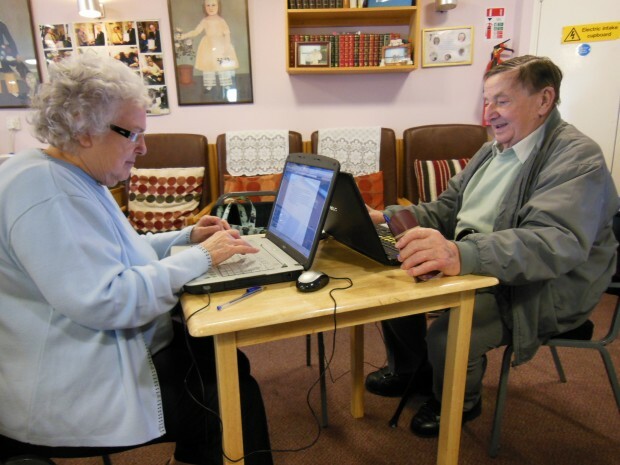 While the original World at your Fingertips programme has now come to an end, residents now continue to use digital equipment and skills, supported by the resident scheme manager. Several of the Castle House residents also go to monthly Digital Bazaar® sessions in the Tate South Lambeth Library where they can meet neighbours and get answers to complex digital/equipment problems. Being able to try things out is key to boosting residents’ confidence in using new technology. The residents are provided with a wide range of digital technology and support which gives them the opportunity to use them whenever they want. As well as a standard broadband computer funded by Lambeth, the residents have a large touch screen computer, an iPad, an android tablet, two still cameras and two small video cameras. There is also a strong emphasis on assistive technology - the computers have large print keyboards and there are trackball as well as ordinary mice to help those with arthritis or tremors. The range of technology responds to the range of needs and motivations of the residents, and there is a large focus on making digital technology less intimidating for residents who are unfamiliar with it. 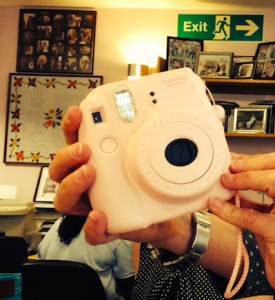 For example, they have a camera known as the “pink pig” (given its similar appearance!) which takes instant polaroid snapshots. This serves as an intermediary technology because it gives residents a more immediate, tangible product and helps break down fears about using unfamiliar technology in the process. The scheme also looks beyond teaching only ‘basic’ digital skills and instead encourages creating a digital culture that allows residents to start learning what they are interested in. This ensures that residents are learning to do things that are relevant to them - which increases their motivation to learn and do an even wider range of things. There is a trusted housing scheme manager at the centre who lives at the residence and has established personal relationships with the residents and so understands their needs. She also has specialised IT knowledge. Her understanding of both the residents and technology is critical in bringing the two together and allowing the residents to explore technology in a way that is meaningful and enriching to their lives. For example, we spoke to Moyra Pettengell who lives at the residence with her husband. When the housing scheme was under threat, Moyra turned to digital technology to champion and save the housing scheme. She contacted the local MP and organised a delegation to speak at a Cabinet meeting at the town hall. This required 20 signatures at short notice, which would not have been possible to organise without access to email. As a result of the programme, all 30 residents of Castle House are aware of and have access to a modern digital environment and several have purchased their own laptops, cameras, and tablets. Castle House is leading all sheltered schemes in Lambeth on digital work and the residents have advised the Lambeth Sheltered Housing Commissioning Team, worked with the Lambeth website designers road-testing the new Lambeth website, and presented their work and equipment to visitors from the Government Digital Service in the Cabinet Office. A couple of weeks ago, the residents of Castle House launched their own website, with funding from Lambeth Living. The website has been a year long project where the residents worked alongside experts to help them choose designs, approach and content, all of which was written by the residents. Check out their website here! Thanks very much for getting in touch with us! I'll get back to you about your question via email.